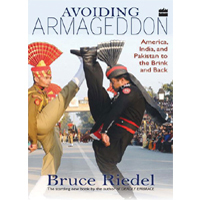 ‘Avoiding Armageddon’, written by former CIA veteran analyst Bruce Riedel, is something of a hotcake book. Riedel is currently serving as a Senior Fellow in the Saban Centre for Middle East Policy at Brookings Institute. He is a prominent expert of counter terrorism, US security and South Asian issues. He has written several other internationally famous books including Deadly Embrace: Pakistan, America and Global Jihad and The Search for Al Qaeda: Its Leadership, Ideology, and Future. The title of the book itself, Avoiding Armageddon: America, India and Pakistan to the Brink to Back, is indicative of the perilous relationships between India and Pakistan, and the role of the USA as a moderator between these two hostile nuclear states. As Riedel has served as special advisor on South Asian affairs to four US Presidents, he possesses in-depth knowledge and a comprehensive understanding of India-Pakistan relations. This book comes into the market at a significant time, when the US is about to revise its policies towards South Asia in light of the approaching withdrawal of its troops from Afghanistan. It explores the relationship between the ISI and Pakistani-sponsored organization, Lashkar-e-Taiba (LeT) and the Al-Qaeda, both of which he argues were fully involved in the Mumbai Incident. Riedel blames Pakistani Inter Services Intelligence (ISI) of nourishing terrorism in the region for obscure purposes and as a tool against India and the US; he says the ISI is assisting Jihadists in preparing the road for a ‘Global Jihad’. Riedel interprets an Ilyas Kashmiri interview – given to Saleem Shahzad – in the following words “According to Kashmiri, al-Qaeda wanted a nuclear war between India and Pakistan in order to disrupt the global counterterrorism efforts against al Qaeda, to complicate NATO’s war in Afghanistan, and to polarize the world between Islam and the ‘Crusader-Zionist-Hindu conspiracy”; interestingly Shahzad does not mention word ‘nuclear’ in his description of the interview with Kashmiri in his book. The book also provides historical context to Pakistan’s role in the Cold War and relations with the US. Riedel admits the fact that in the cold war era, USA used Pakistan for its interests and when its purpose was achieved, it turned a deaf ear to it. During this era, USA tried to establish good relations with India, but in response, India did not accept these overtures and rely on USA, and instead remained part of the Non-Aligned Movement. Riedel also describes Pakistan’s concerns regarding American ‘betrayals’ at every crucial moment. The role of the US was very significant during all three major wars and the one limited war between Pakistan with India. Each time, the US played a crucial role in establishing a ceasefire between the two countries. During these wars, both countries were annoyed with the US for not supporting them completely. The book also enlightens its readers of the role played by the US to avert nuclear war following the advent of nuclear weapons in South Asia. From 1987 to 2008, on the brink of every crisis, the US got deeply involved in managing the development of events and reducing heightening tensions so as to pull both countries away from Armageddon. Riedel supports and strengthens the notion that Pakistan is a central hub of terrorists, where well-known terrorists with ‘head money’ on them are living openly. Riedel claims that the newly selected chief of Al Qaeda, Dr. Ayman al-Zawahiri, Taliban Ameer Mullah Umer and Hafiz Saeed Chief of LeT all have hideouts in Pakistan, with the knowledge and support of certain actors in Pakistan. All these terrorist groups/ individuals are directly a threat to the US, India, Afghanistan as well as Pakistan itself. Writer is worried that these allegedly Pakistan-sponsored terrorists are provoking India to initiate limited war against Pakistan; a war that has the potential to easily escalate and convert into nuclear war. The book asserts that the heart of the problem between India and Pakistan is Kashmir, and due to this issue, Pakistan is sponsoring terrorism against India. American actions on this issue can make a bad situation worse, and there is only limited evidence that they can make things fundamentally better. Riedel argues that the United States is best at conflict management, not conflict resolution. Riedel predicts that should another crisis like the Mumbai incident occur, it would be harder for America to prevent India from taking any offense steps against Pakistan. The American playbook thus far would be useless. The major thesis of this book is that the United States has been unable to achieve most of its goals in the region; every President from Roosevelt to Obama has found the subcontinent to be a tough place to move forward. Riedel argues “Washington should quietly but forcefully encourage New Delhi to be more flexible on Kashmir.” He also suggests to the American government that it is in American interests to resolve the Kashmir issue at the earliest. He also charges that it is in fact the Kashmir issue that has engendered global terrorism. In my view, the core argument of the book is that the ISI is responsible for disturbing regional peace by supporting terrorist organizations and promoting terrorism for “Global Jihad”. One vital factor that the writer neglected however is that India is also equally responsible for peace in the region, nor did not mention Indian involvement in Afghanistan against Pakistan. In 2009 former Pakistani Prime Minister Yousif Raza Gilani handed over the Indian involvement’s proof in Baluchistan to his Indian counterpart. Author does not describe the role of Indian secret agencies like RAW in creating disturbances in Baluchistan and funding Baloch rebels. Finally, it is important to note that the author mostly uses secondary sources of data in his book. One must read this book to enlighten ourself, in order to explore some interesting things.